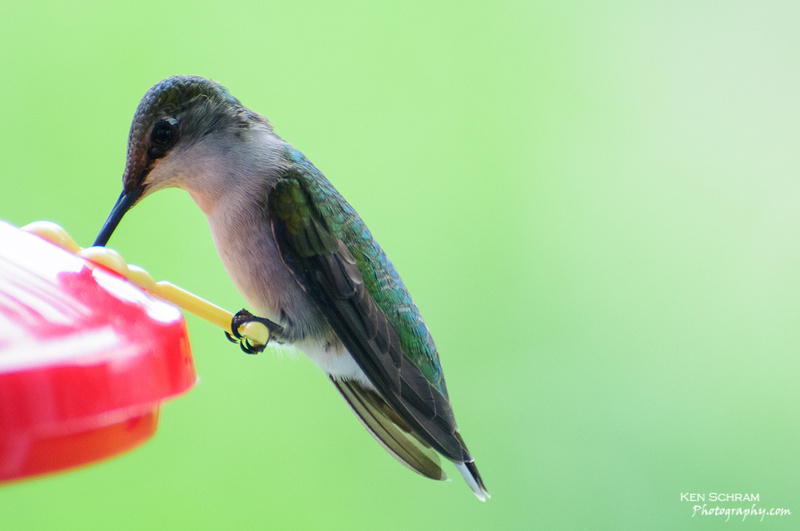 My wife has hung various hummingbird feeders around the homestead each summer for as long as I can remember. Evidently it’s earned her a reputation with our tiny feathered friends as this year we’ve been completely inundated by these incredible tiny giants. Due to the shear number of hummer families now zooming around the house, the number of feeders has increased in an attempt to accommodate. Being the territorial little buggers that they are, each of them prefer to lay claim to an individual feeder, exert most of their energy warding off trespassers and the rest of their time refueling. We’re now sporting a feeder on nearly every window of the house and going through at least a gallon of sugar water EACH DAY! The photo above is of the little female that’s declared the feeder stuck to my home office window as her own. This gave me a unique opportunity to set the camera on the tripod, tether it to my laptop with Lightroom, and then proceed to snap (mouse click) some images from behind the desk which the diners have agreed is a “safe” viewing distance.